Connected by a courtyard to our clinic, the Sports & Culture Studio Gladdori has comfortable facilities for runners, including a training gym, locker room, shower and sauna.After changing at Gladdori and going for a run, runners can take a shower and sauna to refresh, relax in the courtyard, and come to our clinic for a massage and stretch. 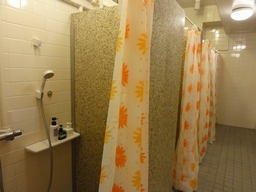 Shower facilities, sauna and courtyard cafe of the gym next to our clinic are available for use for 500 Yen. Convenient Location. Our clinic is just 17 minutes walk from the National Stadium Japan, 35 minutes from the Imperial Palace, and 3 minutes from the State Guest House and the Crown Prince’s Palace. It’s the ideal place for a massage and stretch after a sightseeing running tour. copyright©2012 JMTRAINER all rights reserved.